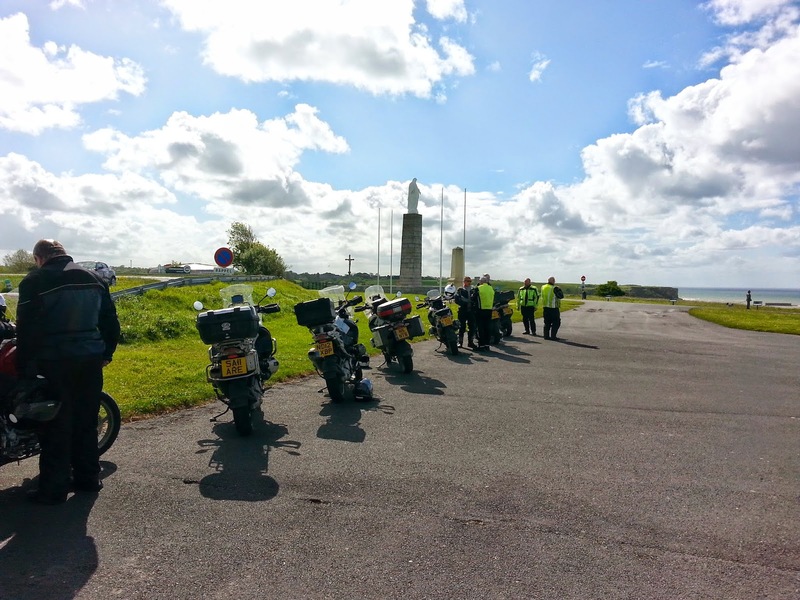 Advancedbiker in Normandy - Day Three - 11th May 2014 -Last Training Day - Where shall we go. 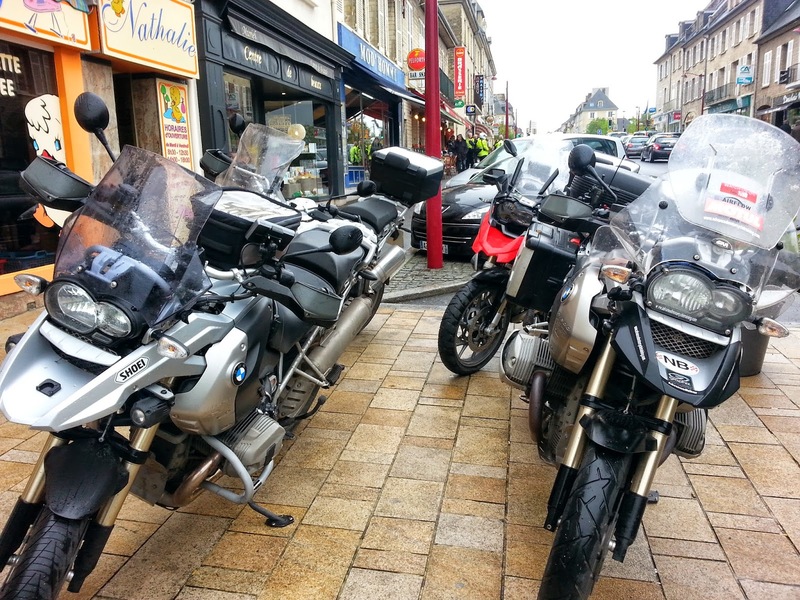 After Aunay, we revisit one of the roads we have used in the past that takes us to Vire. 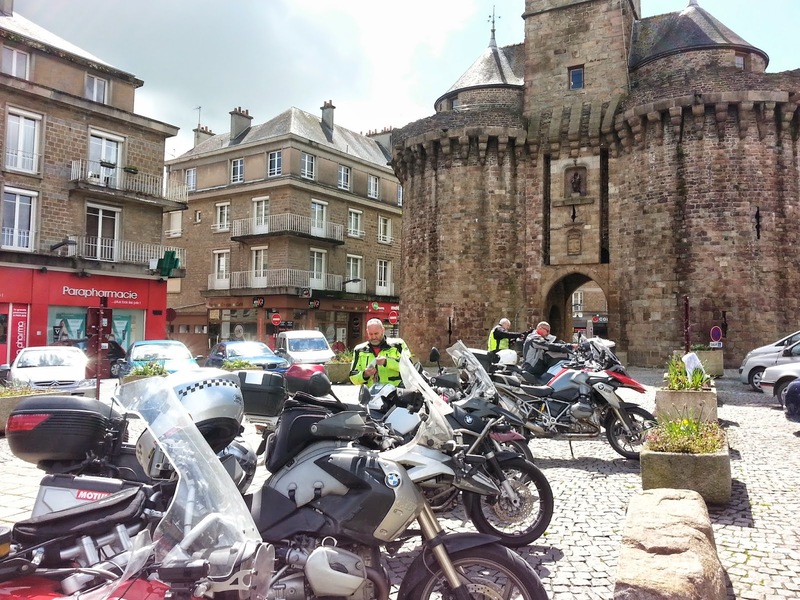 A great place where we always park the motorcycles under the clock tower. Would you get that in the United Kingdom - I think not ! 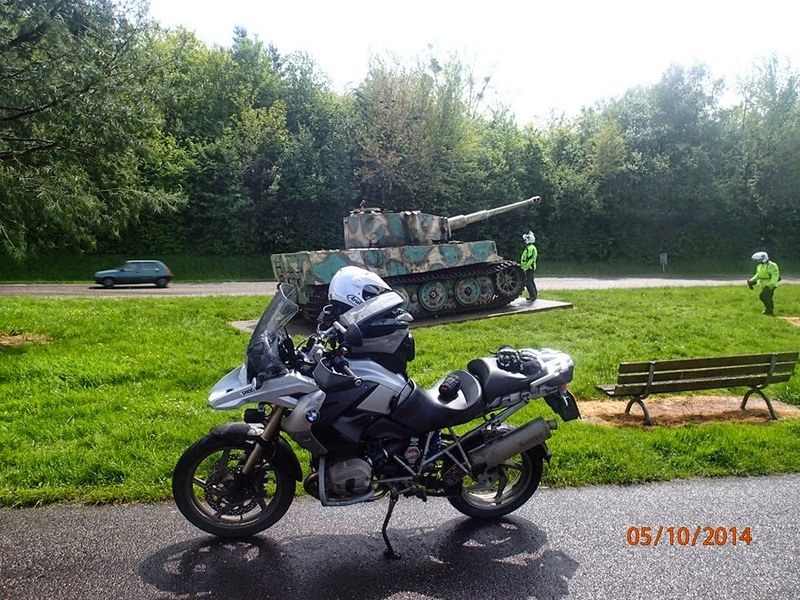 Advancedbiker in Normandy - Day Two 10th May 2014 - Training day in search of the Tiger ! 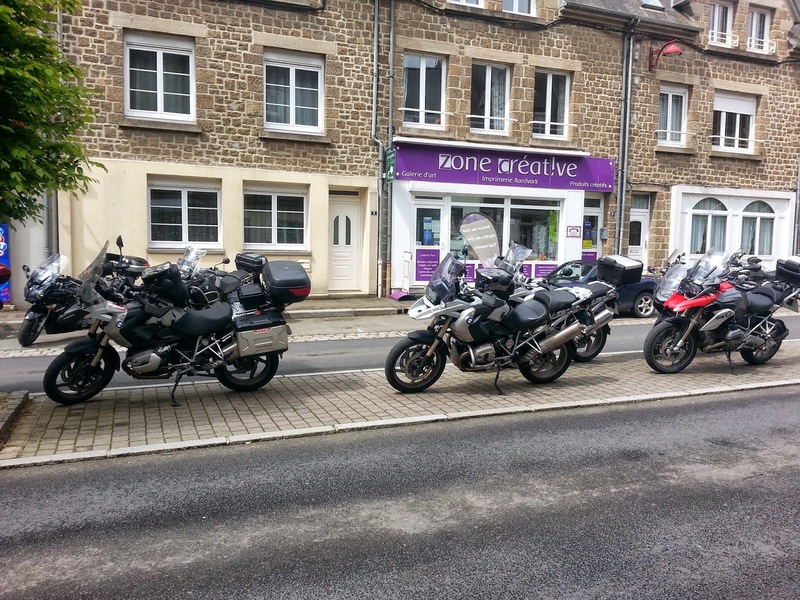 Another damp start, but planned the route today, with the help of Rick, who was going to be the leader as we headed out of Arromanches to find a Tiger Tank somewhere near to Falaise. 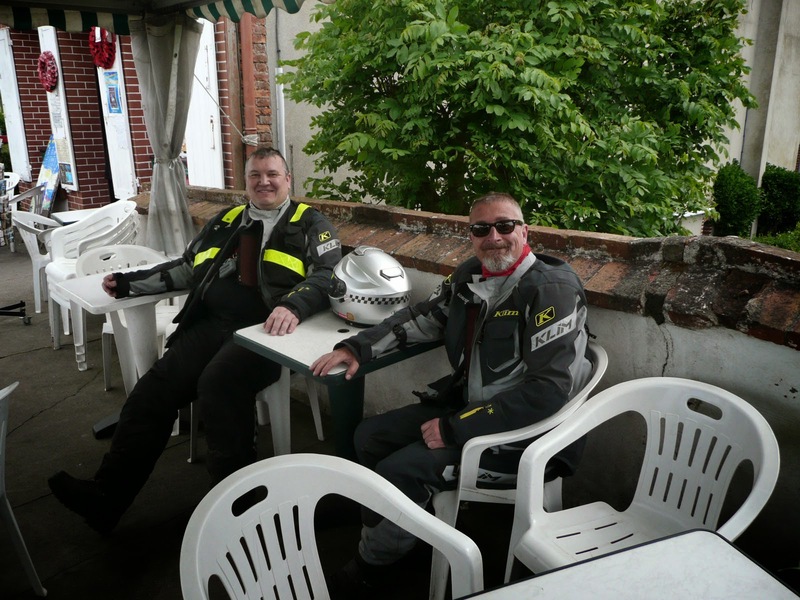 Early tea - coffee stop in Villers Bocage and to regroup and look at the skies...... A bit of mixture, but some blue about, so not all that bad. 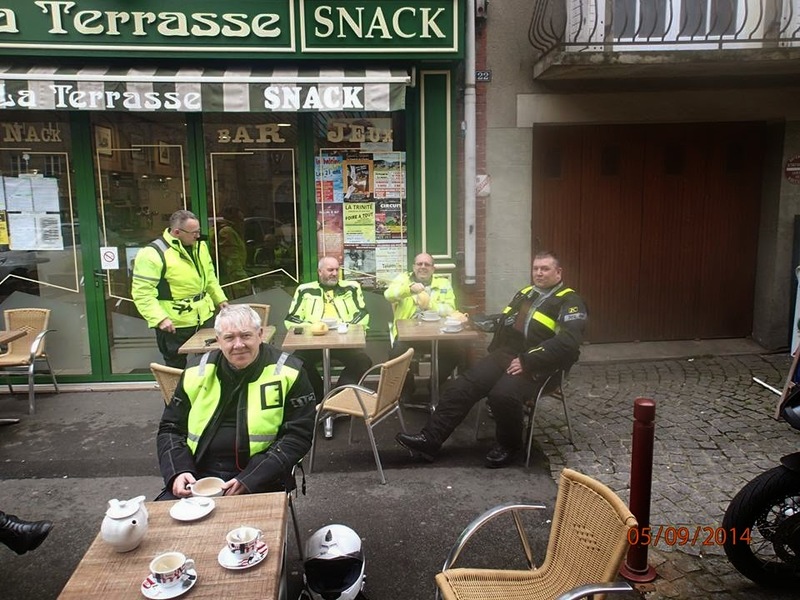 Despite the damp conditions, spirits are up and everyone learning by KEEPING IT SMOOTH, we can still make progress when safe. 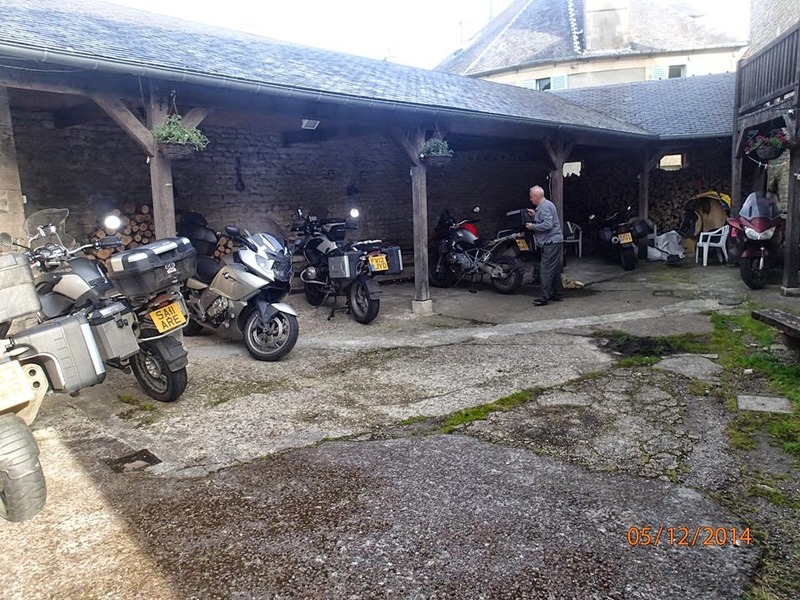 We managed to get to Falaise and went into a restaurant that looked very promising, good menu, snacks etc so we ordered..... No Crepes, no sandwiches, but we do have Sausage and chips.......... What seemed like a lifetime, we left and all my timing were out. 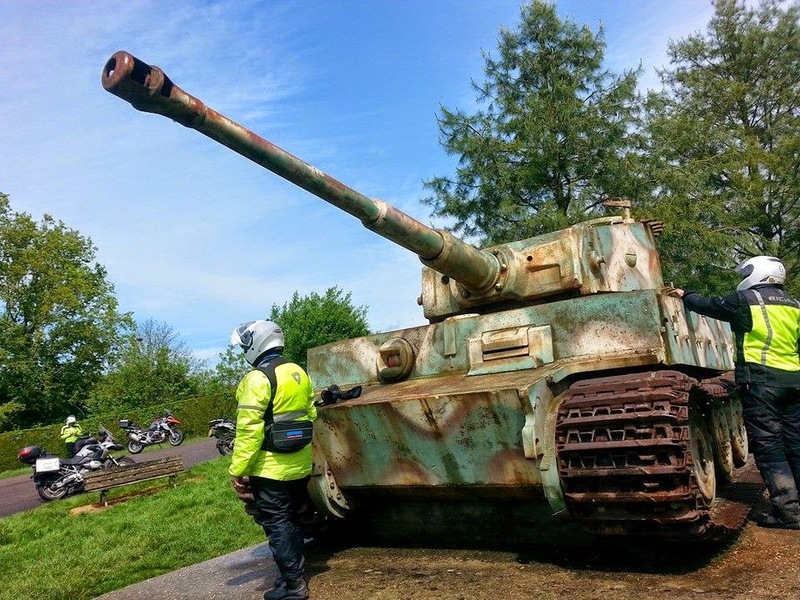 Never mind head for the Tiger tank at Vimoutiers and then back to the coast and Pegasus Bridge. 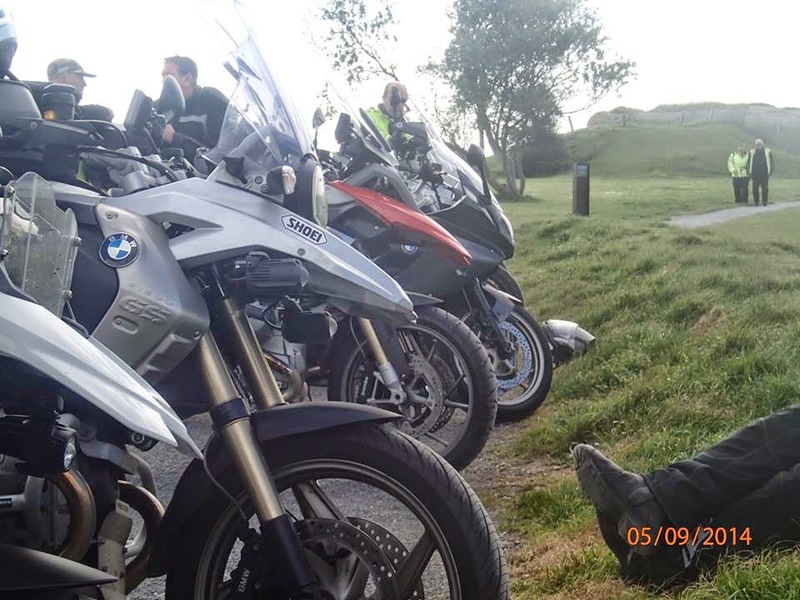 After a good nights sleep and hearty breakfast, time for some training, but first to the petrol station to fill and then organise the days training. 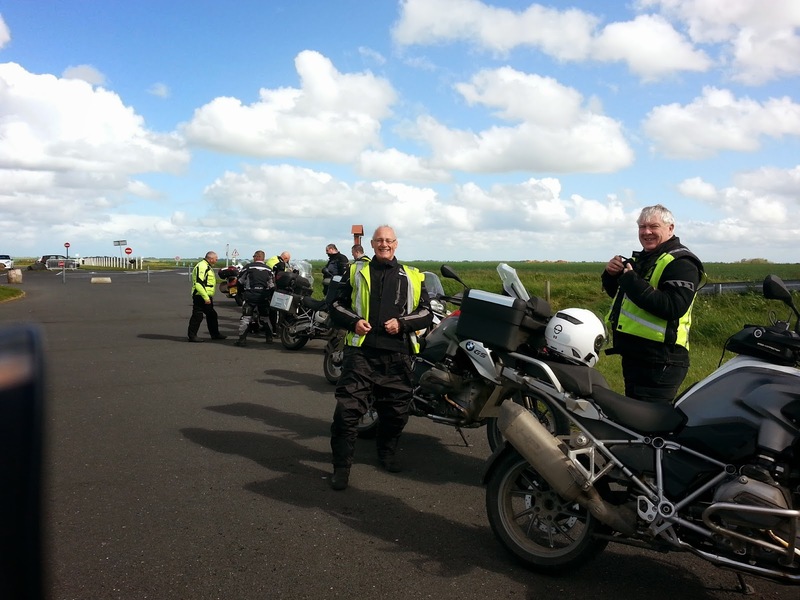 The group consisted of 10 riders, which included 4 trainers and 6 clients. So I arranged for small groups of three to start off with, with a ratio of one trainer to two clients. This gave me the flexibility to use 'Tail End Charlie' Bob as an extra pairs of eyes. 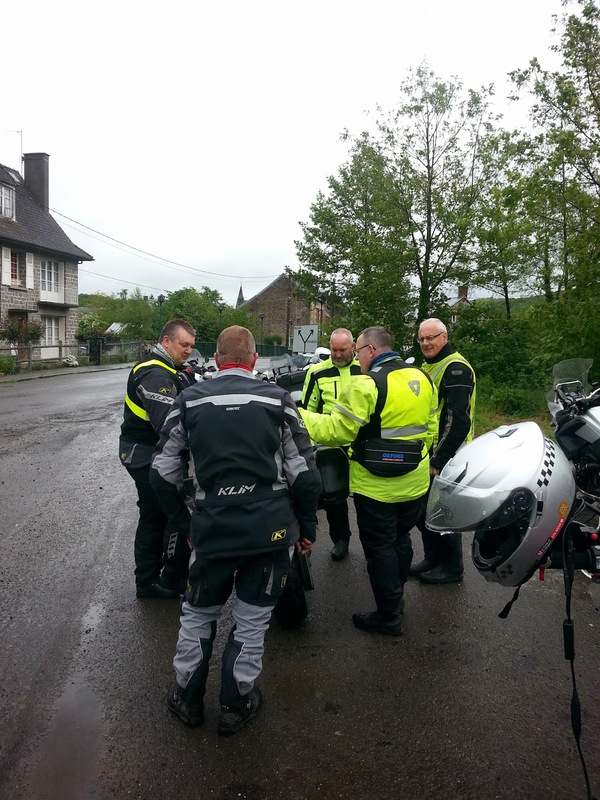 We were on time, so was a heavy down pour, but great to meet up as he had volunteered to take us on a route for our first tea stop at Balleroy, at Les Roches de Ham from there. 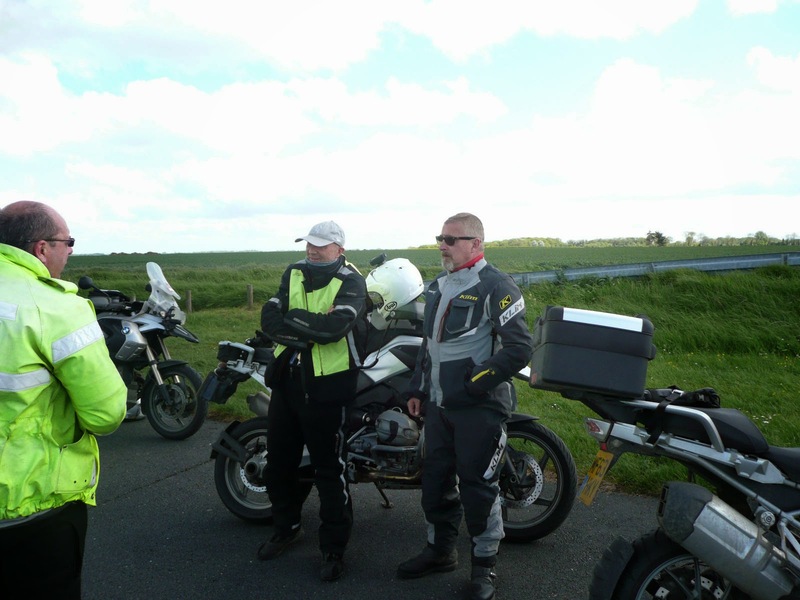 So Ron became our temporary leader as the weather improved and he roads started to dry out. 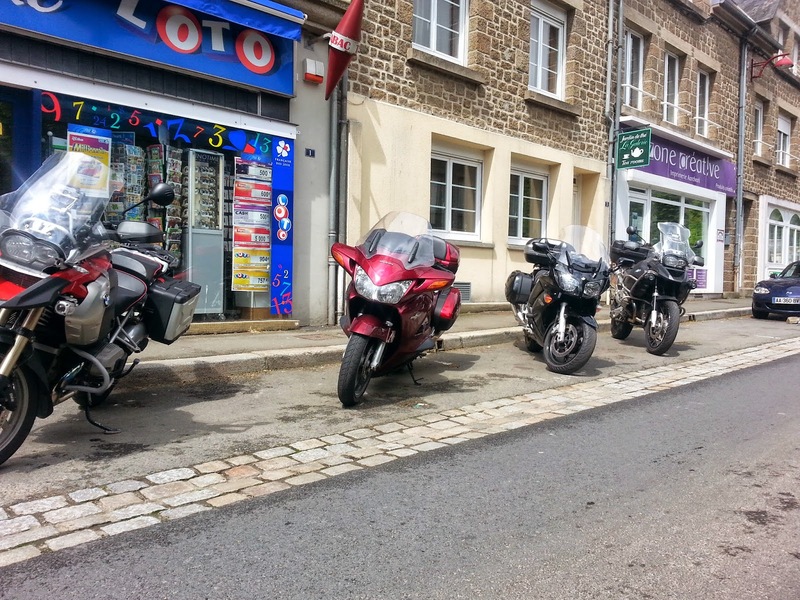 Plan B - Head for a cup of Tetley tea at Villedieu Les Poeles before heading off to find one of our favourite roads the D999 to Brecey and the D911 to Sourdeval. 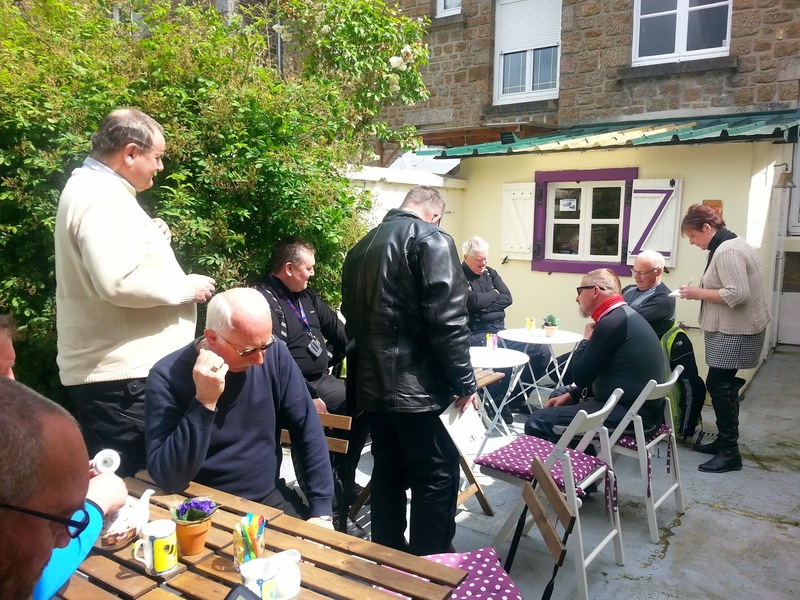 Suitably refreshed, it was on to the D911 again out towards Tinchebray, before heading north tworads the coast and the final tea stop of the day at Aunay Sur Odon. 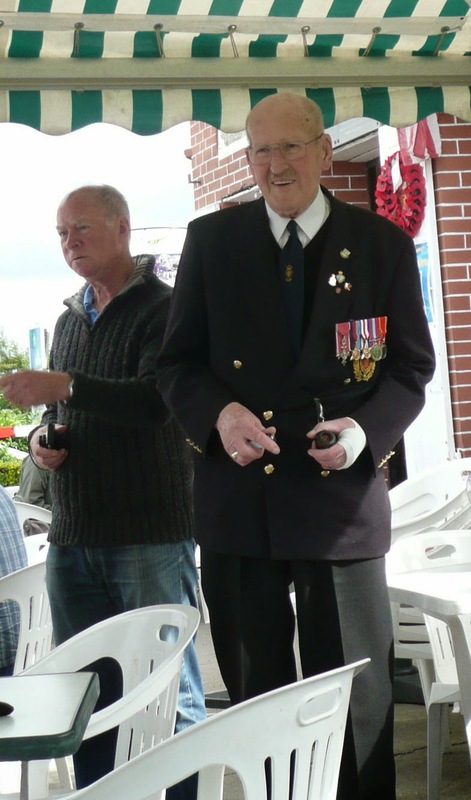 We said our farewells to Ron who headed back home, leaving us to head towards Arromaches. 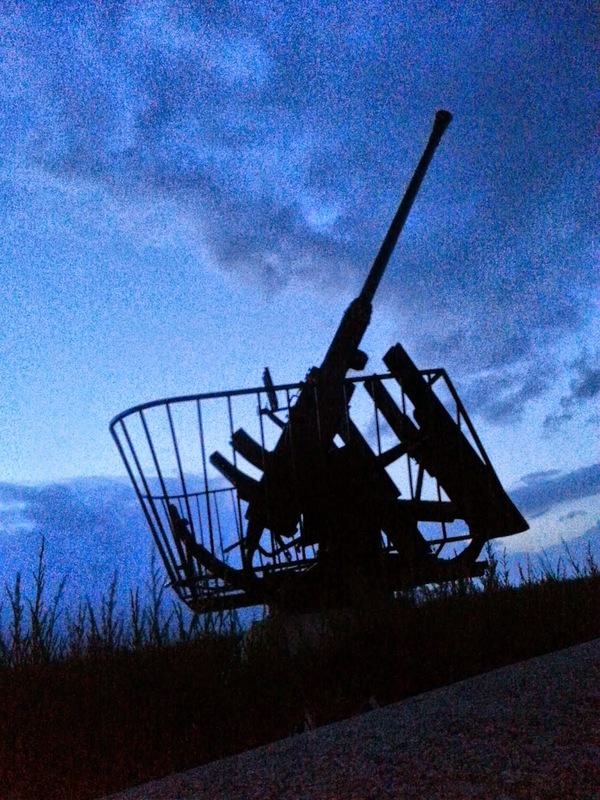 We had a little time in hand so we headed for Longres Battery to do a little bit of World War Two site seeing. 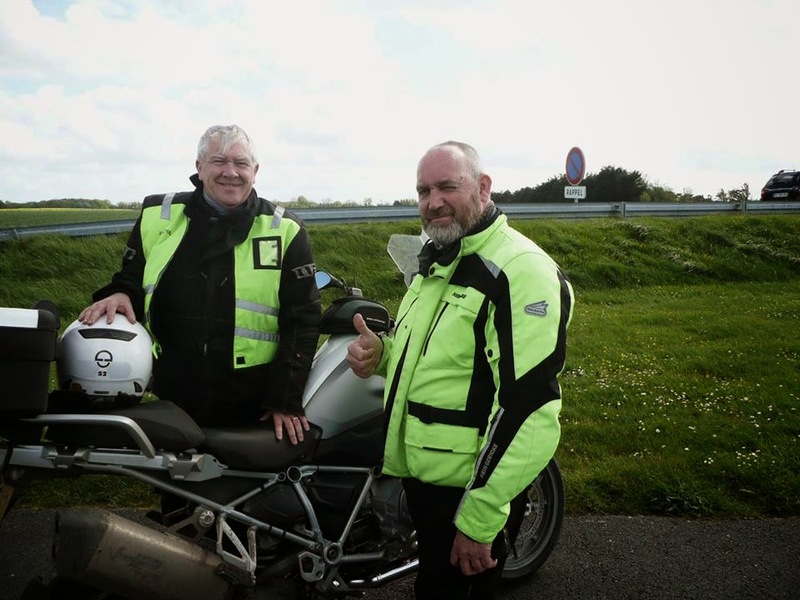 Well after all the planning and a few administration issues, we made it to Normandy again this year for our annual Advanced Motorcycle Workshop, which this year ran from Thursday 8th May to Monday 12th May. 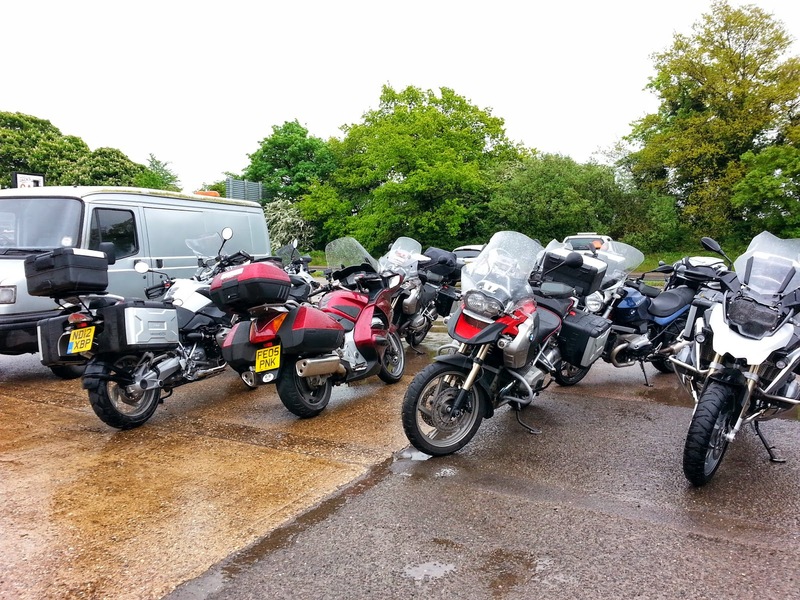 So on a very wet Thursday morning we all set off from different location around the United Kingdom and met up at prearranged meeting points mainly around the M6 and M1 motorway network. 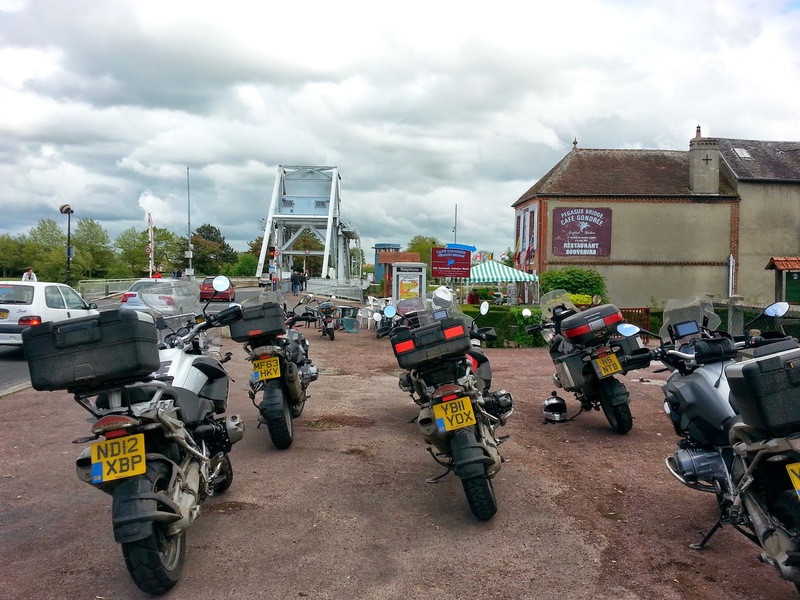 Our aim to get to Portsmouth for the Ferry to Normandy. 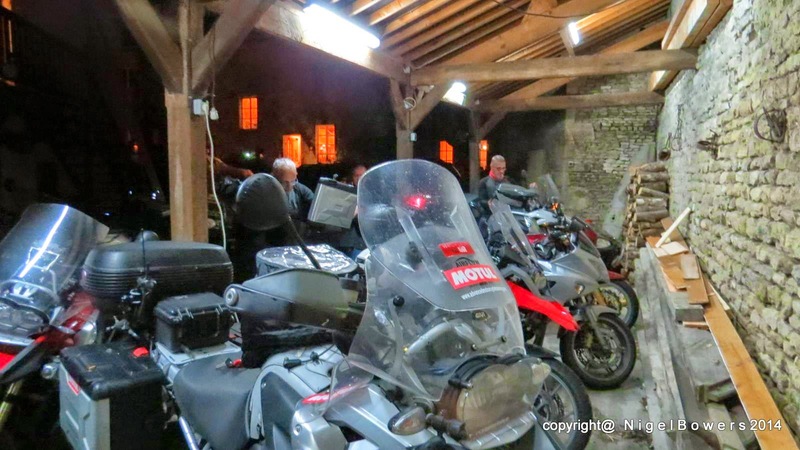 All fed and watered, next stop Portsmouth for the 14.45hrs Brittany Ferries crossing the Ouistreham - a cruise, arriving 21.30 hrs local time. 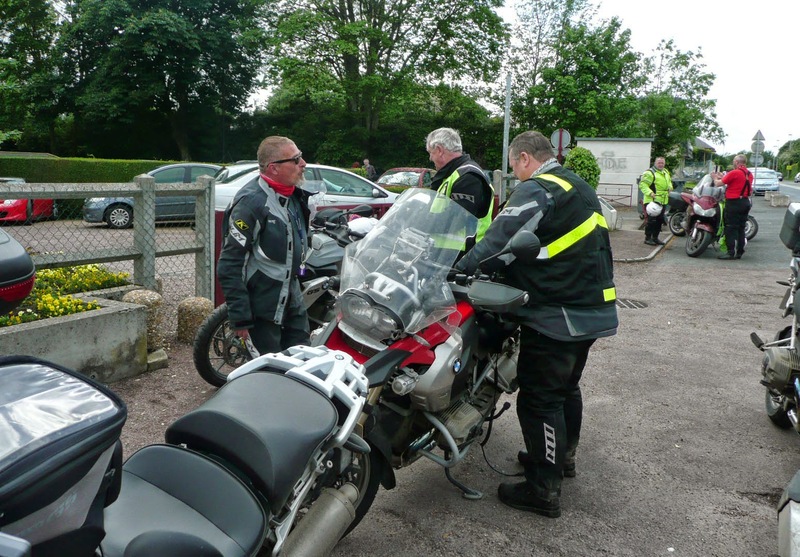 After an eventful run to Portsmouth, in other words, who has pinched the petrol station at Winchester and having to find one in Portsmouth. 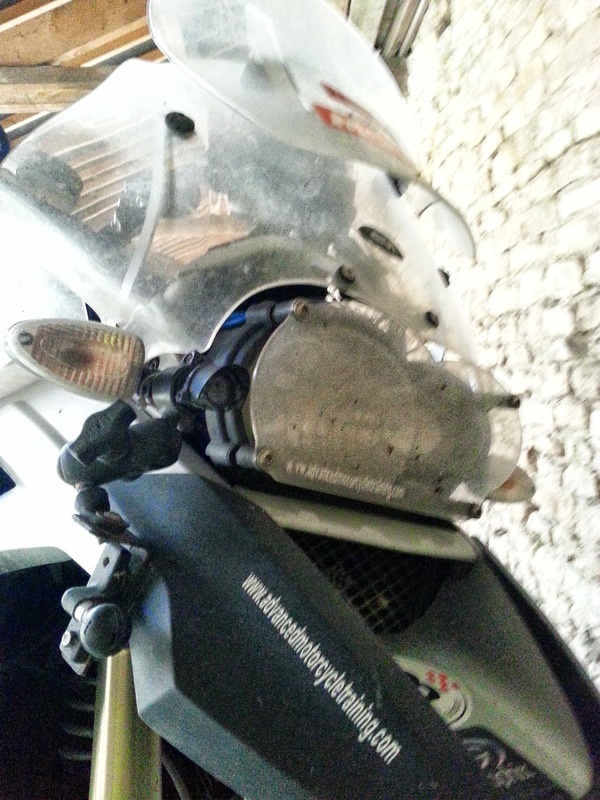 I was cutting it a bit fine, 21 litre tank, put 20.5 litres in it. 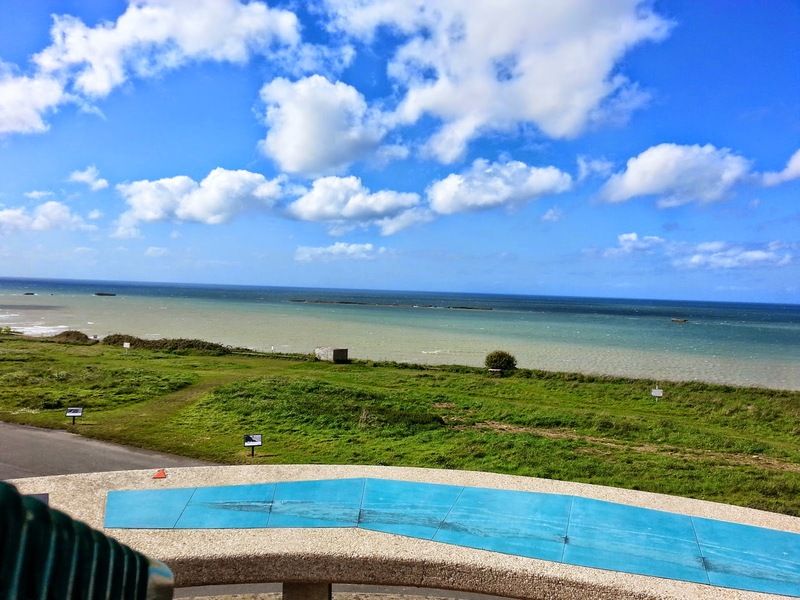 Never mind still in a good positive mood - made all the better by the way the staff at Brittany Ferris booked us all in. 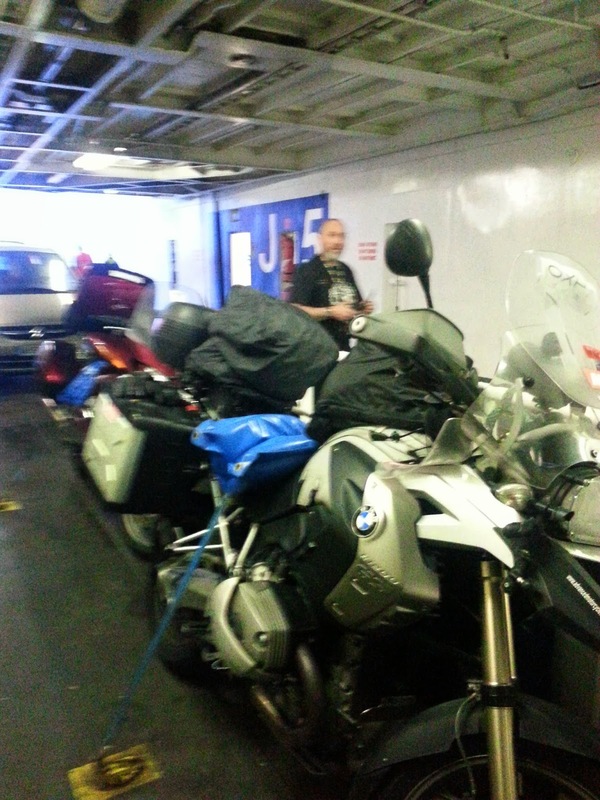 I had booked on line and filled in all the vehicle details, so when we got to port, it was just a matter of matching the riders names to the appropriate registration numbers. 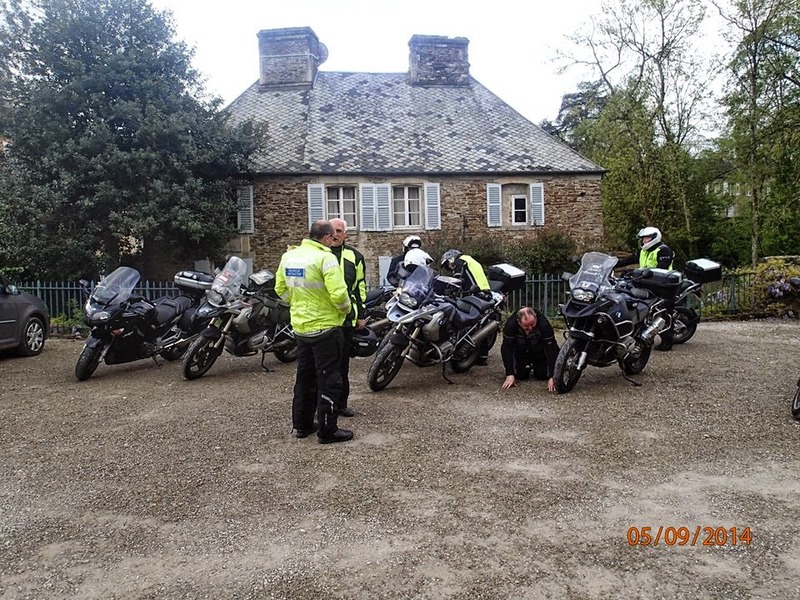 Having seen all the motorcycles through, it left me and Bob....... And you must have guessed what was going to happen next - SECURITY check.....Question from G4S,' Can we check your motorcycle? ', reply; 'What are you looking for? '....Reply;' Guns, Knives etc'....Come on, I couldn't pack an extra paper clip in one of my panniers, but had to open them and they checked my clothes etc. 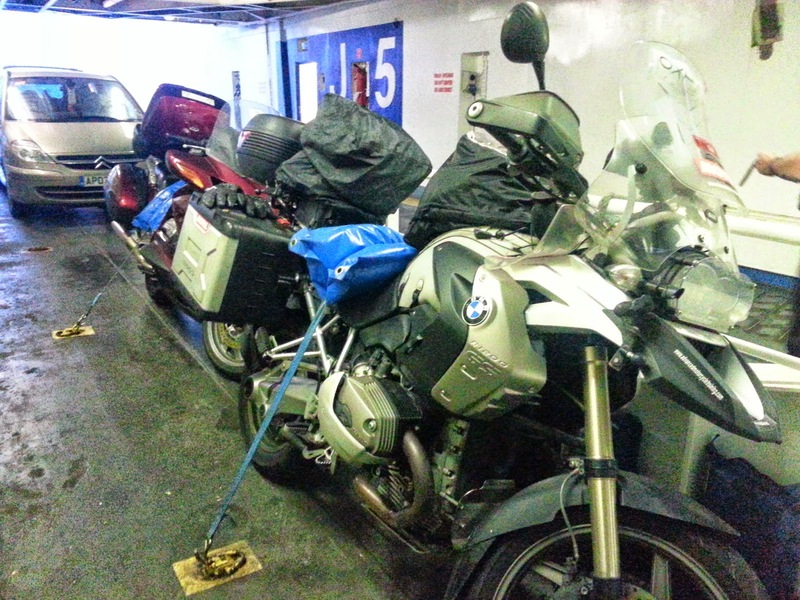 Anyway safely on the ferry, tied down and ready to go........Next stop Normandy, France. 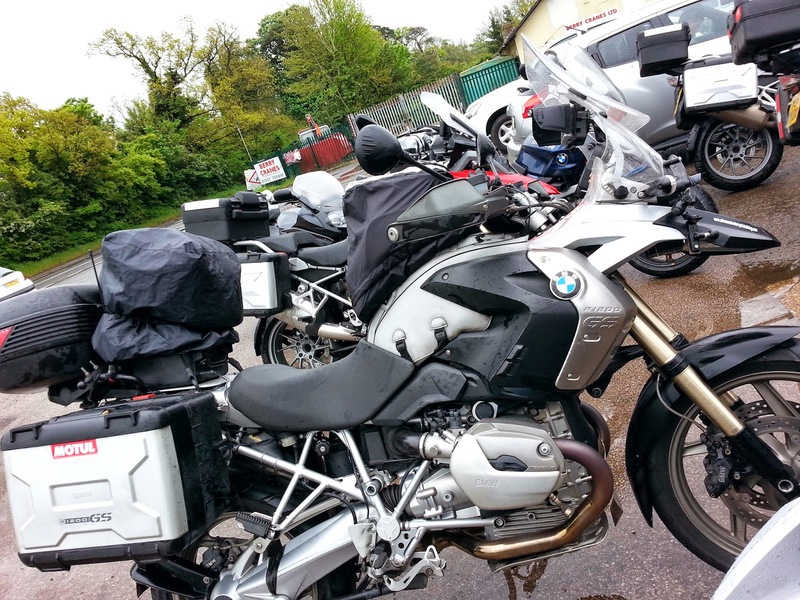 A49 Overtake - Yes No Maybe ?